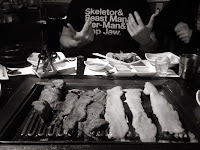 It had been a light day of eating so I was looking forward to dinner, Korean Barbecue at one of the best of it's kind, Road to Seoul on Western. The place was surprisingly crowded for 3:30 on a Sunday afternoon but once our party arrived (most of your party has to be there to be seated) we were led a table already set up with the necessary accouterments like salad, rice paper, hot sauce, bean sprouts and kim chee. Soju was ordered with a side of lemon but for the second time in a row at KBBQ, broken glass reared it's head. I didn't break a glass this time (I had just met JCVD that day, I was amped, the glasses were sticking together, sue me) but two of the shot glasses we received were cracked from rim to bottom. They say you're supposed to cook non-marinated meat first so the grill doesn't get too mucked up but we went for sauce dripping bulgogi, pork belly and brisket leading to baby octopus, beef tongue, sirloin, spicy chicken and much more. At one point the fat from a strip of pork belly (oversized bacon) hit the flames and flared up, my hand over the grill and all. Everyone pulled back, including the table next to us. I somehow managed to finish flipping the meat without suffering any burns or singed arm hair. The slow 90's jams kept coming and this is the same place that blared four versions of Sy's Gangham Style during a previous dinner. Around the corner on Pico is a great spot for ice cream, Mateo's. This ain't Baskin Robbins as you have Mexican fruits and smoked milk on the menu along with a plethora of bars. We opted for a scoop of chocolate and one of leche. It was very flavorful without being too rich and sweet like say a Coldstone Creamery. Seemingly always busy, we loitered out front in the cold, eating our ice cream. After a fun convention, Star Wars in 4DX, KBBQ and ice cream, the day was one of those you just can't complain about. Masters of the Universe Lives!